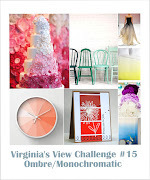 You can create beautiful ombre papers with it and it it super easy! 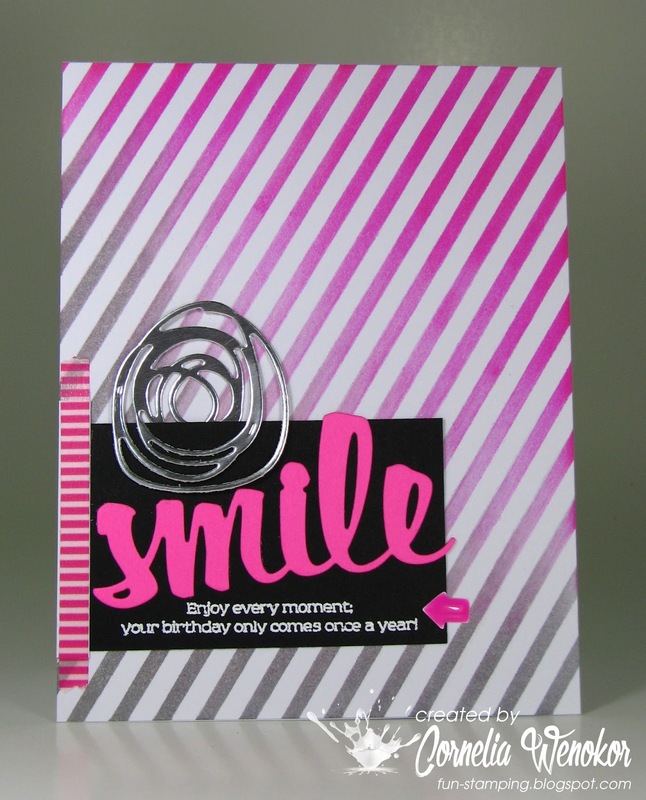 That's another stellar color combo, especially, with the neon pink sentiment on black. Beautifully embellished, as only you can do. A lovely, stylish card. Great colour combo. Absolutely gorgeous Cornelia. Loving the pink, black and grey. Aaah, tolle Karte! Ich liebe jede Form von Ombré Effekten und dieser ist besonders schön! Another fab card. Love what you do with that stencil! SO FABULOUS! Love the color combo! This is fabulous, Cornelia! I love how you've done the sentiment panel - very 'graphic design'! Oooooo, AAAHHHHH, OOOOhhhh! what a great card!! So deliciously graphic!! I love the stripes and the silver scribble is just the touch it needed... All I have to say.... is..... WOW!! Ohhhhhhh...so pretty in pink! Just love this card, so amazing! hello Cornelia! this is awesome, fabulous style and colors! 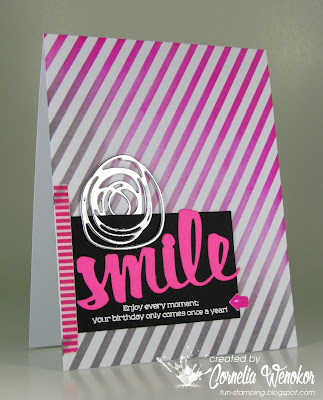 I am so glad you joined us for the Simon Says Stamp Wednesday Challenge! 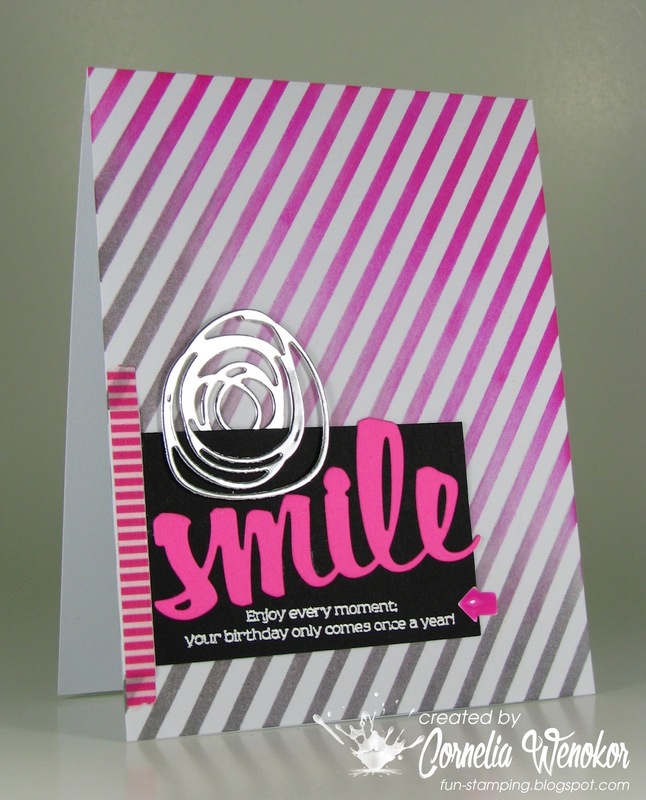 You've inspired me to get out my stripey stencil and give it another try. 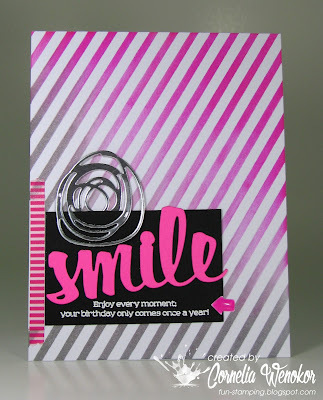 This is such a brilliant card and love the ombre from pink to grey, such a gorgeous colour combo. Another fabulous design!! Sensational card Cornelia! I Really love the graphic feel and the bold colors!!!! 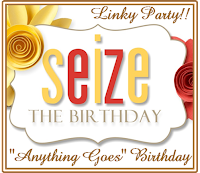 Thanks for taking the time to join us at Seize the Birthday we sure do appreciate it! What a great background you created with that stencil. love the colors and the scribble flower. Thanks so much for joining us at Seize the Birthday. Oh my...dazzling! Absolutely dazzling! This is one of those fun, yet classy cards that has me giddy with delight. Another swoon-inducer...You and that stencil are a charming pair!